Made of 2 pure leather sheets with an anti stretch sheet between the leather, for fixed bars and sure for spring bars also. Made of 2 pure leather sheets with an anti stretch sheet between the leather,320 mm long, 1.4 mm thick, for fixed bars and sure for spring bars also. Made brushed ss loops and a high class brushed ss buckle, hand stitched buckle end, the leather is soft like a Peach and long as the real NATO strap with the same thickness as the real NATO strap. They are available from 16mm to 24 mm . Note: Because the square ss loops are no longer available we have to switch to ss round wire loops, means new made straps will come with the ss wire loops in the future! 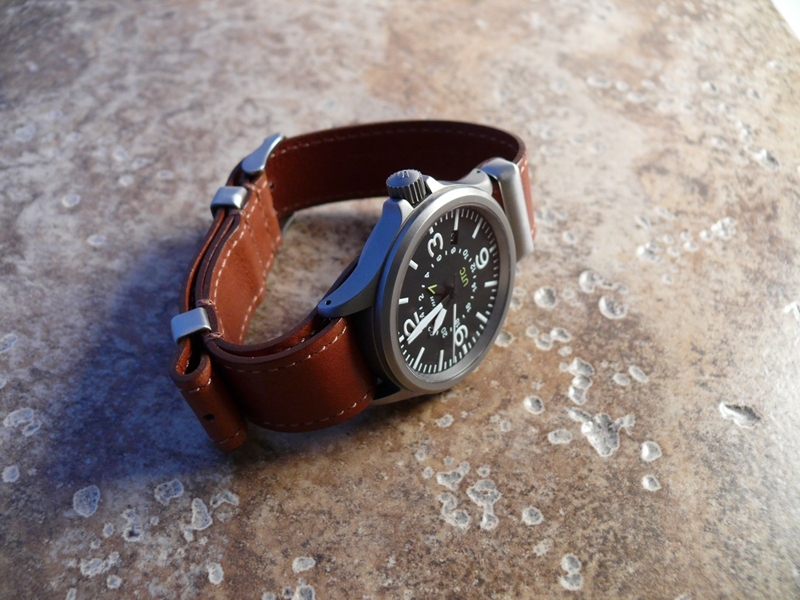 Note: Our Nato Leather straps are made to old Military requirements, thats why Customers with small wrist size may need additional holes! We recommend to ask a shoemaker or jeweler or watchmaker because they normally have the right punching tools to punch additional holes in your new strap.